"I can solve anything in the world!" Atlas has revealed a new US trailer for the upcoming American release of a comedy film titled Absolutely Anything. This film was originally released in Europe back in 2015, and has been waiting to get released in the US until now. One way they're marketing it: this film features the "final" performance by Robin Williams, who voices a talking dog. Absolutely Anything is about a goofy school teacher who is granted the superpowered ability to make any wish or desire come true. Simon Pegg stars, with Kate Beckinsale, Sanjeev Bhaskar, Rob Riggle, Robert Bathurst, Eddie Izzard, and Joanna Lumley. This looks pretty bad, but the only redeeming side is that it's directed by Monty Python's Terry Jones. Maybe there's some good humor? It looks like this was lost in the 90s and only recently found. A disillusioned school teacher (Simon Pegg) suddenly finds he has the ability to do anything he wishes - a challenge bestowed upon him by power-crazed aliens, watching him from space. Absolutely Anything is directed by veteran English comedian/actor/filmmaker Terry Jones, one of the Monty Python members and director of the films Monty Python and the Holy Grail, Life of Brian, Personal Services, The Meaning of Life, Erik the Viking, and Mr. Toad's Wild Ride previously. The screenplay is written by Terry Jones & Gavin Scott. This actually already opened in theaters in Europe back in 2015, and in Asia in 2016, but is just now finally making its way to American theaters this year. 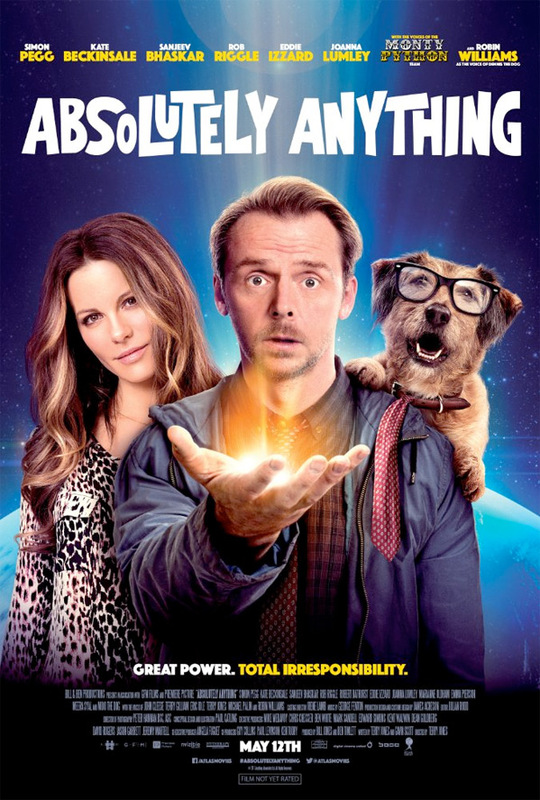 Atlas Distribution will release Jones' Absolutely Anything in select US theaters starting May 15th later this month. So is anyone interested in seeing this?